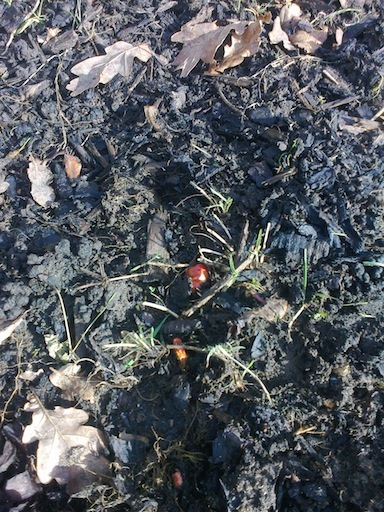 The other good news is that we can see tiny red tops of the rhubarb which has just started to grow, hurrah! I had no idea it started this early, but apparently it does and, hey, I’m not complaining. 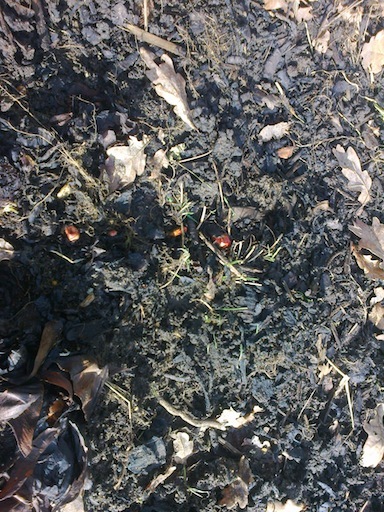 Ok, I know they’re very small so you can hardly see them, but they’re hugely exciting for us! Whilst down there, we decided to plan a flower bed in front of the shed where we were intending to put the greenhouse, but that’s going to be too complicated now. We’ve marked out the space and also factored in enough space in front of the shed for a small table and a couple of chairs – so we have dreams of sitting out in the summer, surveying the estate (ha!). I thought I might put poppies in the flower bed – as the deer won’t eat them as they do at home – and maybe a rose bush too. Just to make it homely. We’ll have to see. Meanwhile, today’s harvest is more winter lettuce (still hanging on in there! 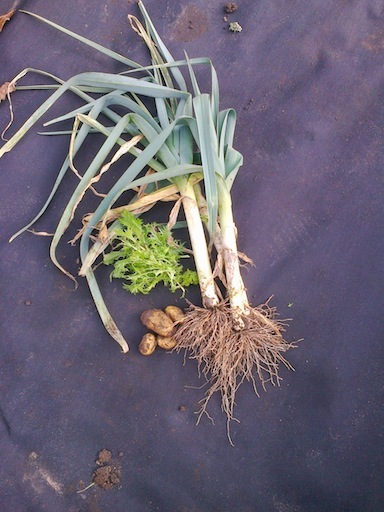 ), three leeks and some unexpected potatoes that K unearthed when he was on digging duties. We proudly transported them all to the car, but on the way one of the leeks escaped and I had to retrace my steps to try to track it down. It was obviously making a quiet bid for freedom, but I’ve corralled it again now, go me! Categories: Allotments | Tags: digging, flower beds, leeks, moles, poppies, potatoes, rhubarb, roses, weeding, winter lettuce | Permalink.